If the stock price breaks down below a support level then it is likely that the uptrend has run its course and a downtrend may be imminent. It follows then that setting stop-losses a few percent below support levels may be a good stop-loss strategy for a trend trading system. Some trading systems specify entering trades at a support level. This can make for a low-risk entry. It means that you are able to set your initial stop-loss closer to your entry price and in doing so reduce your risk. If a stock price is at an all time high then there is no overhead resistance to potentially slow down the stock’s upward advance. As we’ve already discussed, support and resistance levels can identify changes in trend direction (i.e. breakouts above a resistance level – uptrend; breakdowns below a support level – downtrend). Some trading approaches plan to buy at support levels and sell at resistance levels. This might be a valid way to trade sideways markets where the price bounces up and down between support and resistance levels. In a trending market though, a trend trading approach would be the preferred way to go. 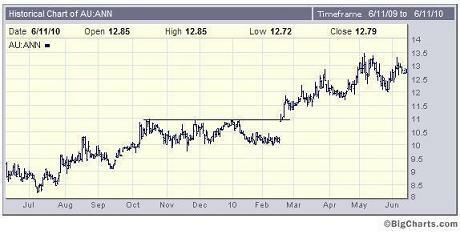 Breakout traders enter a position when the stock price breaks out above a significant resistance level. They might also insist on the stock’s volume rising when the breakout occurs to give them some confirmation that the price is likely to go higher. 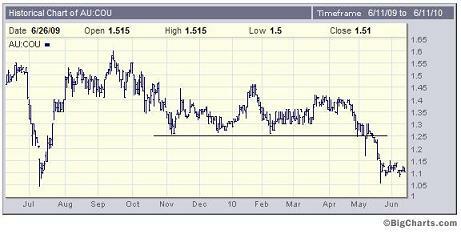 Once a breakout occurs above a resistance level, this prior resistance level becomes a support level. Conversely, if a breakdown below a support level occurs, the prior support level becomes a resistance level. 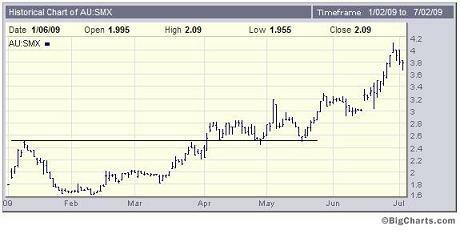 The stock chart above displays how a resistance level can become a support level once penetrated. Notice how the price breaks out above the resistance line in April 2009 and provides a floor for stock prices going forward. Look at support and resistance levels in conjunction with the dominant trends of the stock – moving averages can make this easier.